Many people are surprised to learn that Kansas has 13 named zoos, as well as other animal parks. Kansas zoos range from small operations like the Cedar Cove Feline Conservatory & Sanctuary in Louisburg to one of the country's largest - the Sedgwick County Zoo in Wichita, Kansas. Caney, Kansas - The Safari Zoological Park is a private zoo, just east of Caney, Kansas, near the Oklahoma state line. Their hours can be a bit irregular and the zoo may not open during poor weather, so be sure to call and confirm before visiting. The small zoo has primates, large cats of several species, bears, wolves, foxes, and tropical birds. A guide takes you though the park on a one hour tour. Clay Center, Kansas - The tiny Clay Center Zoo is free and open 9 AM - 8 PM, 7 days a week. The Clay Center Zoo is run by the Clay Center Utility Company. It is part of a park across from the power plant. Some of the cages are very small and barren. Dodge City, Kansas - Wright Park Zoo in Dodge City is one of the smallest zoos in Kansas. Portions of the zoo are old, but there is more room and better facilities for the animals than many WPA zoos. Emporia, Kansas - The David Traylor Zoo is a small zoo, but far from the smallest in Kansas. One of the biggest events iin 2014, was the arrival of an orphaned male cougar cub from the state of Washington. This free zoo is open 10 AM - 4:30 PM, 7 days a week. Garden City, Kansas - With 300 animals of 100 species, the Lee Richardson Zoo is larger than most zoos in Kansas. The layout is not very easy to follow and many of the animals are hard to see. Admission is free if you walk in, but there is a charge of $10/car if you drive in. The zoo is open 8 AM - 5 PM in winter and 8 AM - 7 PM from April - Labor Day. The Lee Richardson Zoo is closed on Thanksgiving, Christmas and New Year's Day. 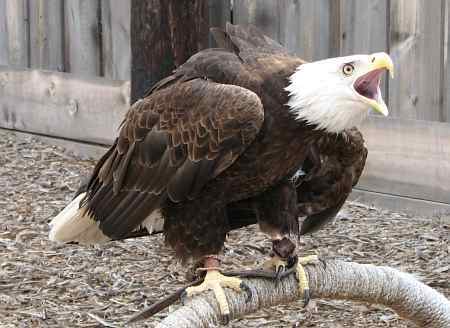 Garden Plain, Kansas - Eagle Valley Raptor Center was started in 2003 to promote conservation of birds of prey through public education, and provide shelter and care to injured & orphaned raptors. The Center and living quarters occupy 10 acres and there are an additional 10 acres of tall grass prairie with a nature trail & small wetlands area. Admission to the center is by appointment for individuals or groups. A $5 donation is suggested and includes a guided, personalized tour. Goddard, Kansas - The Tanganyika Wildlife Park opened to the public as a zoo, in June of 2008. Tanganyika is a non-profit breeding facility for rare and endangered species. Species represented in the park include giraffes, tigers, snow leopards, and zebras. Tanganyika Wildlife Park distinguishes itself from other Kansas zoos by emphasizing interaction between visitors and the animals, There are many opportunities to feed or pet wildlife as diverse as lemurs, camels, birds and snakes. Closed for the winter, open April through October. Hutchinson, Kansas - The Hutchinson Zoo has only about 160 animals and doesn't take very long to visit. It says a lot about the pride of the community, that Hutchinson maintains this zoo, when the spectacular Sedgwick County Zoo is only 40 miles away. Open limited hours, seven days a week. Free Admission. Independence, Kansas - The Ralph Mitchell Zoo is one of Kansas' oldest zoos. Older features include a monkey island built as a 1930's WPA project, and "Kiddy Land." Although the surrounding Riverside Park seems to be doing well the Ralph Mitchell Zoo has declined from its best times. Open 7 days a week. Free. Junction City, Kansas - Milford Nature Center is located below the dam impounding the 16,200 acre Milford Reservoir. The nature center provides many things for visitors including live animal exhibits (fish, birds, animals, reptiles & amphibians), taxidermic specimens of same, nature trails, a butterfly house (open from late May through early October), playground, and a picnic shelter. The nature center sits next to a Milford Fish Hatchery . Lawrence, Kansas - The Prairie Park Nature Center displays more species than several of the attractions that call themselves zoos. The display hall has a surprising large selection of plants, birds, insects, reptiles, amphibians, fish and small mammals. The live species on display are supplemented by dioramas with stuffed animals, and also by wild birds and mammals which come up to the nature center's windows. Louisburg, Kansas - Cedar Cove Feline Conservatory & Sanctuary isn't a park, but a preserve for tigers and a refuge for big cats of other species which are abandoned, neglected or whose owners are unable to care for them. Cedar Cove is open to the public on Weekends only. Each visitor or group of visitors have a personally guided tour. Manhattan, Kansas - The Sunset Zoo is one of the most popular zoos in Kansas. Most displays are modern & roomy, and the animals all appear healthy. This zoo is fun. Manhattan, Kansas - The Insect Zoo at Kansas State University includes displays of preserved, live and fossil insects. Several of the displays are hands on, including the use of microscopes to view preserved insects, and a creative kitchen display where each cupboard or drawer had examples and details about the creatures that may be found there. Nickerson, Kansas - The Hedrick's Exotic Animal Farm Bed and Breakfast Inn in Nickerson is open for both overnight guests and tours. Tours include seeing 30 varieties of exotic animals and feeding and/or petting cattle, camels, ostriches, rheas, zebras, antelope, kangaroos, and giant tortoises. The tour concludes with a pony ride (for those under 85 pounds) and camel rides for all. Open year around, with tours by appointment only. Overland Park, Kansas - The 12 acre Deanna Rose Children's Farmstead has farm animals, birds of prey, gardens, nature trail, a one room country schoolhouse, fishing pond, Kanza Indian encampment, horse drawn wagon rides, and pony rides. This petting zoo has become more of an agricultural theme park. Open 7 days a week April - October. Free only on Monday through Thursday. Pittsburg, Kansas - Nature Reach is an outreach program of Pittsburg State University's Biology Department. Nature Reach offers interactive small group programs both on the Pittsburg State campus and in schools. The campus location has a collection of wild animals which exceeds the size of most nature centers. Nature Reach also has a Natural History Reserve which is located several miles southwest of Pittsburg. There are 79 acres of partially reclaimed mine land and the Natural History Reserve Laboratory & Raptor Care Facility with its owls, hawks, vulture and crow. Pratt, Kansas - The Pratt Education Center, Aquariums and Fish Hatchery are operated by the Kansas Department of Wildlife and Parks. Displays, dioramas, and exhibits display both living and preserved native birds, fish, mammals, and reptiles of Kansas. The Aquarium Room contains twelve 400-600 gallon aquariums displaying fish species that are native to Kansas or that have been successfully introduced into Kansas. Other rooms include live snakes and prairie dogs. Salina, Kansas - The Zoo at Rolling Hills Wildlife Adventure is on 60 acres, adjacent to the Rolling Hills Ranch and the Museum. The animals are in spacious enclosures and appear to be in excellent health. If you visit on 2 or 3 zoos in Kansas, Rolling Hills should be one of them. Closed Christmas Eve, Christmas Day and New Year's Day. 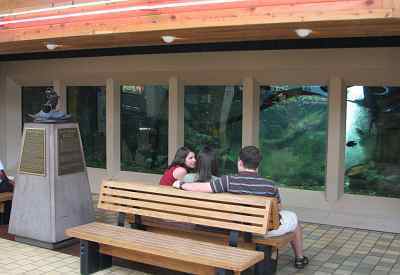 Salina, Kansas - The largest free standing aquarium in Kansas is the Kansas Fishes Exhibit at the Central Mall in Salina. The 15,000 gallon aquarium is home to 50 - 100 turtles and native fish, including channel catfish, blue gill, crappie, wipers, largemouth bass, white bass, and walleye. Free - open during regular mall hours. The fish are fed daily at 4 PM. Topeka, Kansas - The best known feature of the Topeka Zoo is the tropical rain forest which was impressive when it was built over 30 years ago. The zoo is well laid out, and the animals are in large attractive enclosures. Wichita, Kansas - The small Kansas Wildlife Exhibit in Wichita's Central Riverside Park opened in 1988, but there has been a zoo here in one form or another since 1901. There are 8 cages with over 20 species of birds and turtles, mostly birds of prey that are also used in education programs. The cages are old and fairly heavy, making it hard to see and photograph the wildlife. There is a lovely adjacent pond. Admission is free and it is open from dawn to dusk. Kansas Wildlife Exhibit, Central Riverside Park, Wichita, Kansas (316) 683-5499. Wichita, Kansas - The Sedgwick County Zoo is the largest zoo in Kansas and one of the largest zoos in the United States. One of Kansas' largest attractions, the zoo is home to more than 2,500 animals of nearly 500 different species. One of the most impressive features is the Downing Gorilla Forest. The Sedgwick County Zoo is open 364 days a year. Kansas zoos and refuges still to be reviewed: Operation Wildlife (Linwood). Please let me know if there are other animal parks or zoos that I have missed or if you hear of changes at the zoos or parks already visited..